Following brutal reports from a few different department stores this week, we mentioned our Death By Amazon Index in a blog post yesterday. Today, we updated that index in one of our B.I.G. Tips reports. Below we chart the performance of the index versus Amazon (AMZN) and the S&P 1500. 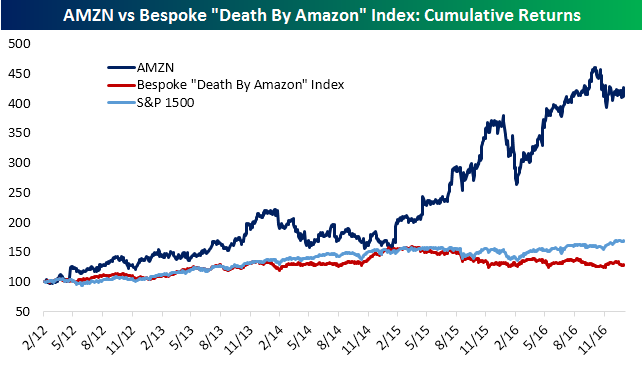 To see the report, which includes more information about the construction of the Death By Amazon Index, its performance, and the stocks that make up the index sign up for a monthly Bespoke Premium membership.